Daily Spirit & Word: 752: Don’t Go Near The Hornet’s Nest. Sin Brings: Destruction and Deportation. 11 This is the answer they gave us: “We are the servants of the God of heaven and earth, and we are rebuilding the temple that was built many years ago, one that a great king of Israel built and finished. 12 But because our fathers angered the God of heaven, he handed them over to Nebuchadnezzar the Chaldean, king of Babylon, who destroyed this temple and deported the people to Babylon. WARNING: Don’t Anger The God of Heaven and Earth. Good morning my friends, have you ever wondered if your sin would bring God’s wrath and anger against you? For hundreds of years after King Solomon had done a marvellous work for God, building the magnificent Temple, there was a long time of decline in National morals. Eventually, after warning the people time and time again, God’s anger burned and He brought upon them the promised punishment and they were deported from His promised land. Sin is rebellion against God. Sin is transgression of God’s law. Sin is breaking one or other of God’s Commandments. Sin is going our own way instead of God’s way. The Consequences of SIN: Destruction and Deportation. Are YOU In Trouble With God? The other week in West Norwood, as we were out sharing the Good News of Jesus, right across the road from where we were witnessing a DRAMA unfolded before our eyes. The Border Police had arrived in great numbers, they’d come to arrest someone to be deported. The crowds gathered instantly, some shouting abuse at the police, others just standing around watching, as they forcefully bundled someone into their big police van to take them away. It really was over-the-top policing, all those officers to remove one individual. A few months ago I watched a Nature programme on TV about Killer Giant Hornets: They invade wasps nests and bees nests and killed every single one of the wasps or bees and steal all their honey. However, when people wander inadvertently too close they too come under attack. That’s what happened to Israel when they stirred up God’s wrath and anger; He sent an overwhelming power to destroy their Temple and deport them to Babylon. After watching those hornets there’s no way I’d go near one of their nests. My friends, that’s what God’s wrath is like too: He didn’t send just another little army to deport Israel, He stirred up an whole Empire and they came if huge force, overwhelming force, to take away the rebellious Nation of Israel into captivity. There was no way they’d be able to withstand an attack from this Empire. In addition to the DEPORTATION the Babylonian Empire also came to DESTROY the great Temple that King Solomon had built for God. When we get angry, someone can step in to the situation and bring peace. However, when God gets angry and His righteous fury is aroused, then there’s NOTHING on Earth that can stop Him. Jonah: When God wanted Jonah to go to Nineveh, initially Jonah didn’t want to go and ran away, however, God brought Jonah to his knees and he eventually took God’s message to Nineveh. It took a storm, being thrown overboard and a big fish to swallow Jonah, but he reluctantly and finally repented inside that huge fish, and eventually did what God wanted from the beginning, to go to Nineveh. Have you ever wondered why Jonah was so reluctant to do what God wanted him to do? Have you ever wondered why the Nation of Israel found it so difficult to obey God’s Commands? Have you ever wondered why you always seem to fall into sin so easily? After all it seems like a no-brainer that walking with God is much better for us, but human beings always think they know what’s best don’t they? Well, this verse tells us what can happen to us if we choose to stir up the hornet’s nest of God’s wrath. When we ignore His warnings, when we refuse to listen to our Conscience. This verse is part of the answer the Jews gave to their enemies when they were rebuilding the Temple after coming back to the Promised Land after the long years of captivity and exile. The verse tells why the Temple needed rebuilding: It had been DESTROYED. It speaks of the provoking of God to anger, and the resultant punishment brought upon themselves by God. This verse tells us when the provoking occurred and what the provoking did. First, when it occurred. “After that.” The context says this provoking occurred after the first Temple was built by Solomon. After a great work was done for God, the people provoked God by their disobedience. My friends, we must be very careful after accomplishing some great work, some good work for God, that we don’t let down our guard. Solomon was so full of wisdom and dedicated, but afterwards, he let down his spiritual guard and fell into temptation. He’d done something so amazing and marvellous, it became a wonder of the world and many people travelled thousands of miles just to see his awesome Temple of God. However his dedication and devotion turned to PRIDE and the great wise king fell into sin. Sadly it wasn’t only Solomon, the whole Nation of Israel was rotten from the Head to the Toe: They’d turned away from God. It is often after a time of great success for God, that Satan attacks and causes us to go astray. What this provocation did was stir up the wrath of God. Like the hornet’s nest, like the OTT Border Security. Sin stirs-up the wrath of God. If there is anything you want to avoid in life, it is the wrath of God. My friends, we all love warm and fuzzy messages about the LOVE of God don’t we? We like to hear about the GRACE of God, the MERCY of God. We’re amazed at the Miracles of God, We’re encouraged by the wisdom of God and the Power of God, but we also need to hear some of the TRUTH about the WRATH of God. Sin stirs-up the Righteous ANGER and wrath of God. Our sin provokes the wrath of God, and nothing is more dangerous for your soul. Finally, The Punishing by God. The punishment was twofold: It involved destruction and deportation. First, The Destruction. 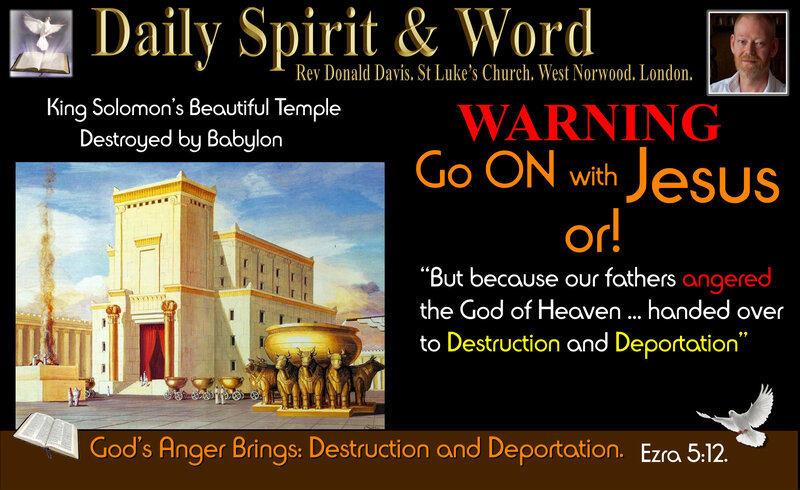 “Destroyed this house.” The great Temple which Solomon had built was destroyed. Israel forsook worship at the Temple, and so God destroyed it. If we are not good at looking after our Spiritual Achievements or of God’s wonderful Spiritual privileges, we will lose them. They will be as if they had not been. Second, the Deportation. “Deported the people to Babylon.” Israel was removed from the Promised Land. When they rejected God, He no longer protected them from their enemies, they came and deported the people to a place far away from the Promised Land. Most of them, never to return. I think that when we get to Heaven we’re going to be totally shocked by just HOW the LORD has been protecting us from evil all our lives. How He’s watching over us, How He’s keeping Satan away from our house, home, family, friends, fellowship and life. However, when we choose to walk away from God, on purpose, we’re opening up the doorway to Satan. It’s like we’re giving him permission to do whatever he wants with all that we hold most dear to us. Don’t give the devil a foothold into your life today. However, there’s something worse than Satan or the Devil. My friends, you DON’T WANT to stir-up the wrath and anger of God or he just might remove that protective barrier and allow something terrible to happen, just to bring us back to our senses and to allow us to see that walking with Him is much better than walking our own way. Heed the warning in the history of Israel: See what happens when God’s chosen people refuse to repent. Heed the warnings given in the New Testament to Believers and Followers of Jesus: Hebrews 5:11-6:12. Times have not changed; this is still true. Our own nation, the UK was once a great world power, we took the Word of God to the Nations of the world at one time, but now God has turned things on their heads, and the peoples of the world are coming back to the UK, they have come to EVANGELISE Great Britain, to bring the Word of God back, because we’ve rejected God as a Nation. Thankfully He’s not destroyed us yet or banished us into captivity. However, we are living like there is no God, like sin doesn’t matter. Everyone is doing what is right in their own eyes again. My friends, we do need to heed God’s warnings. As far as you are concerned, follower of Jesus Christ, don’t stir up the Hornet’s Nest of God’s wrath and anger with your sinful choices. See sin how God sees it and hate it as much as He does. Repent and turn again to God. Do the things you once did when you first came to know and follow Jesus Christ. Just last night we were standing outside KFC (Kentucky Fried Chicken) sharing the good news of Jesus with a couple. A man came out and immediately began to shout abuse at the couple. Apparently they had purposefully leaned up against his car. He was really angry, I mean, really angry. It’s strange how quickly ANGER gets stirred-up in a person. He began to racially abuse the man; the car owner was Jamaican and the man we were talking with was African. He said, “You African, you boy, you are ignorant”… with a few more unrepeatable words. Richard, who’d come out with us for the first time since doing the Alpha Course, was brilliant, he just stepped in the middle of the two of them, peace guys, peace. He offered the car owner £1,000,000. He initially said, “I don’t want your money”… Then after a few moments said, “What is that?”… He jumped into his car, but before he did, I grabbed hold of his hand and said, “Jesus is LORD, we are Christians, Here’s a little Coin with the Ten Commandments, Jesus sees hatred as murder”. Richard, said, “Forgiveness is for everyone”… He smiled and said, “I know, I know”. It’s amazing HOW PEACE can be RESTORED. Jesus has delivered every Christian from sin, He set us free, so that we can now live a life that’s pleasing to God. But, we must continue to walk with Jesus every day. “Take up your Cross daily and follow me” We all need to walk with Jesus and be full of the Holy Spirit and keep our eyes on Him every day in order to know how to avoid sin in our own lives. As we do so, He will transform our minds, renew our thinking and enable us to experience His JOY in our hearts. (Romans 12). Christian brothers and sisters, we all need to heed this frightening warning today. God hates sin it makes Him so angry. We tolerate sin, but it stirs our God to Wrath and Anger. We all know people, who were once great followers of Jesus who’s lives lie in ruins now because of their sinful choices. To BE A FOLLOWER of Jesus Today: Believe in The Lord Jesus, Repent of your sin, Receive Him as your LORD, Be Baptised and Be filled with His Holy Spirit and Follow His ways. I don’t want the LORD to send an mighty Empire against our Nation. I don’t want anyone I know to experience the wrath and anger of God. I want everyone to come back to Jesus now. I’m also praying that when we’ve been successful, when we’ve done great things for God, we’ll not get proud and conceited and be tempted to fall away and fall into sin, pride, folly, and ignite the anger or wrath of God. Amen! It’s half-term, I hope you are all enjoying the holiday week. Stay close to Jesus. Be filled afresh with His Spirit. Walk in PEACE. A vision to share the LOVE and JOY of being a follower of Jesus. St Luke’s Church, West Norwood, London. 7.30pm.